MONARK: New Virtual Analog Synth from Native Instruments – Dubspot Video Preview! Dubspot synth correspondent modular77 brings you a sneak peek at Native Instruments’ newest software synthesizer, Monark: a re-creation of classic analog monosynths like the iconic Minimoog Model D.
Native Instruments released a teaser video recently hinting at a new synthesizer soon to be released and featuring some impressively fat and aggressive analog-style acid and bass sounds. Now that Komplete 9 has been announced, more details about this mysterious new synth have been unveiled. 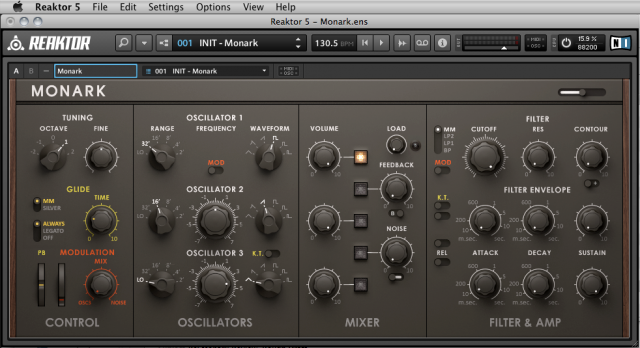 The enigmatic “M” we have all been pondering is now revealed as Monark, a new synth instrument which runs in Reaktor 5. 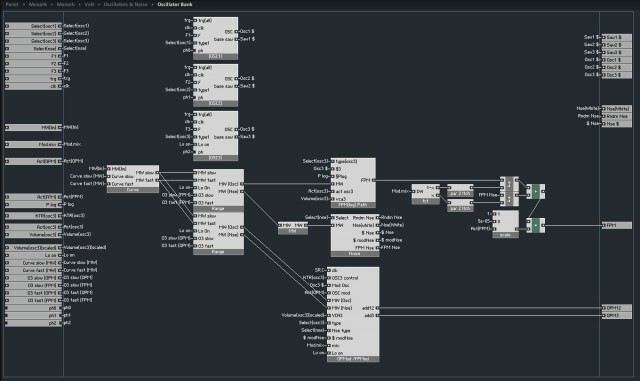 Monark will also be included (in Reaktor) with both versions of the Komplete 9/Komplete 9 Ultimate bundle. Chances are anyone reading this post is already well acquainted with the sound of the Minimoog, immortalized by a seemingly endless list of classic recordings by Pink Floyd, Herbie Hancock, Kraftwerk, New Order, Depeche Mode to name just a few, as well as more recent offerings by dance artists like Daft Punk. After just a few moments of twiddling with the friendly layout of Monark’s knobs, it becomes even clearer that Monark is a faithful recreation of the classic Minimoog. Out-of-the-box, it comes packed with presets that give instant access to sounds such as the solo patch from Yes’ classic “Starship Trooper” or the power station bass tones of Kraftwerk’s “Autobahn.” There are also presets aimed at more contemporary genres such as dubstep bass wobbles and chiptune/8-bit style cling-clang sounds. The output of these three oscillators is fed into a mixer section, to control the amount of signal from each of the three sources. The mixer section features an overdrive/distortion circuit that can add a nice warm fuzz to the oscillator mix. 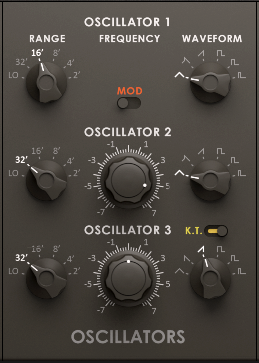 It also has a unique oscillator feedback effect which allows the oscillator signal path to feed back on itself, creating a modulated distortion character to the output. In addition there is a noise generator which can be used to add percussive tone character and sweeping effects. The oscillator/noise mix is then fed into a powerful 24 dB/octave low-pass filter, a faithful re-creation of its walnut-paneled ancestor. The Monark filter can also be switched to other filter types including 12 dB/octave low-pass, 6 dB/octave low-pass, and 12 dB/octave band-pass. No high-pass filter is available, but then the original Mini had only a low-pass filter. 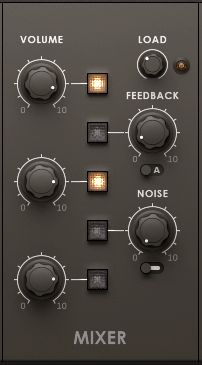 Another welcome feature of the Monark filter is its ability to self-oscillate when the resonance amount is pushed to its maximum. The filter can also be keytracked, which allows for the self-oscillating resonant filter to be played chromatically across the full frequency/keyboard range. Switch the oscillators off, crank the filters resonance all the way up, start sweeping the filter cutoff knob then give R2D2 a call! The filter is modulated by a familiar filter envelope generator layout; this as well as the amplifier envelope generator function exactly like those found on the classic Minimoog. They are each equipped with three controls: attack, decay and sustain. The release portion of the envelope is governed by the amount of decay that is set, and is active when the dedicated release switch (one per envelope generator) is active. Other useful functions are found under the Monark faceplate, including a global octave-transpose knob, a master fine-tune knob, glide, and pitchbend / modwheel controls (MIDI-learnable). There is also a second page of controls which provides more global fine-tuning parameters for Monark. These include parameters that govern how Monark responds to the MIDI keyboard, pitchbend, modwheel, and tuning facilities. There are also controls for re-creating filter and oscillator tuning imperfections in order to create a more realistic analog experience. All of these parameters can be MIDI-learned as well. Minimoog Market: How Does Monark Stack Up? As you probably know, there are other software Minimoog replications on the market, most recently the Arturia iMini for iOS (featured in our iOS Roundup yesterday). The basic Minimoog layout is simple and easy to work with, which is one of the reasons that it has lasted so long and been copied so many times. 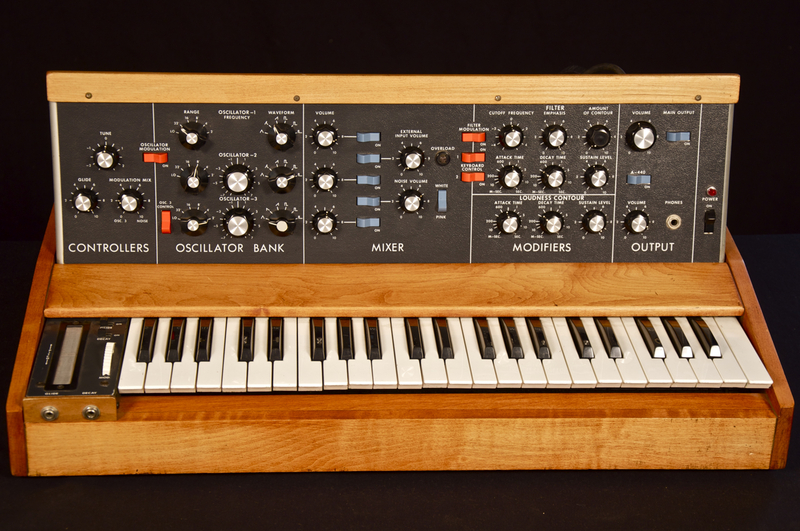 However, just because something looks like a Minimoog on the surface doesn’t mean that it necessarily sounds like a Minimoog, so how does Monark measure up on this score? The thick and aggressive sounds in the demo video are certainly impressive, and we were able to get some fat sounds pretty easily in our experiments with it. In the final analysis the only important question is, is this something you are likely to use? Not all of us have access to a real Minimoog, and without making a direct comparison, Monark is certainly one of the finest instruments in this class that we’ve heard. It’s also worth saying that many users of Monark are likely to have to whole Komplete package, which also includes a growing range of analog-style effects also modelled in meticulous detail, such as the Solid Mix Series or the analog effect suite in Guitar Rig 5. 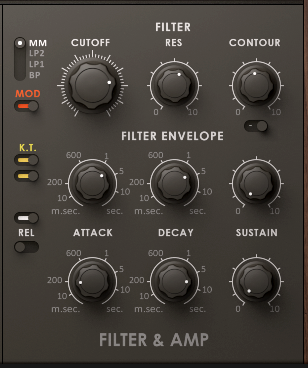 Using these effects with Monark can give it even more gritty old-school sound if that is what you are looking for. From a user perspective, the elegant Minimoog layout makes it easy to do basic subtractive synthesis and sound design because the signal flow is easy to understand. If you’ve never worked with a Minimoog before, a few minutes with Monark will already give you an idea why this design has stuck around so long. Native Instruments told us that the development team working on Monark did a lot of complex modelling work under the hood to make their replication of the original analog sounds as accurate as possible. For example, the keytracking for each oscillator is calibrated just slightly differently to give that sound of analog imperfection and this is adjustable (as explained above). The tuning of the oscillators can drift slightly, just like a real synth, and so on with many other minutely-replicated details that add to the overall analog sound and feel. The Minimoog and its classic analog monosynth brethren have been used on countless iconic recordings, here are a few of the most famous tracks that have some of their main synth parts played on a Minimoog. Once your ear gets used to the Mini’s sound, you’ll realize you’ve heard it many times before.